Yesterday I enjoyed joining my friend June Frickleton at her private view of her solo exhibition at the Birley center in Eastbourne, uk.She drove me and two other friends from Brighton to the venue 30 miles away. The private view was a success with many artists and friends attending. I was reminded of the importance of the support of our fellow artists on our artistic journey. Below is a photo of June and I along with one of her art patrons in front of one of the paintings which sold. When we finally stepped out of the Birley Center we were aghast at the raging snow storm that greeted us. We piled into June’s car and skidded our way through hill and dale. Luckily I am familiar with driving in snow coming from western Canada so as a team we were able to make it safely back home. This private view will certainly be remembered. I am so pleased to have been able to support my friend on her snowy journey. I have painted with digital art for many years as a tool for exploration of scenes and subjects that I might wish to explore in the future. I also use it to see if a painting needs to be modified. Recently I retrieved a painting from a gallery which was unfortunately closing down. Once back in my studio, I had a good look at it and decided that the perspective was not as I wished it to be. I downloaded it into my digital app, Procreate, and started to add paint and colour to areas in order to correct the perspective. I am now happy with the extension of the golden wheat field and hay bails over the lower half of the painting. It is a mixed media piece with torn painted pieces of paper added so I may use this technique to change it as well. I will now go back to the canvas and add the corrective painting to it. Once finished, I’ll add it to the website. Thanks to the digital tool, I can do this on my iPad and not be messing up the painting trying to fix the problem. We have arrived here in our Canadian home in Whiterock. Looking at it with fresh eyes I am again amazed by the beauty of the surroundings and shores of the Pacific. Things here in the little corner of the greater Vancouver area have a slower pace and lack of the bustling public which the city of Vancouver has. . This is also very apparent in comparison to England which seems so crowded by comparison. Don’t get me wrong as I love the English countryside and history around every corner. Nature can be a teacher when one just looks. I have the pleasure of giving a two day Master Artists demo at the White Rock library this coming week. It gives me a chance to talk to the public about my art which will be on display as well as working on a little textile piece that needs machine stitching and who know what else. Here is the piece. I will update you on what it turns into. A few days ago I had the pleasure of visiting both the National Gallery in London for their Monet exhibition (which was excellent) as well as the Frida Kahlo exhibition at the Victoria and Albert museum. I knew nothing of Frida to my horror as I try to at least be aware of outstanding female artists in history. The exhibition was a very good one but I was perplexed that more was not said about her achievements as an artist in her own right. Yes, Frida was a colourful figure with her long Mexican dresses and head dresses of flowers and yes, she was married to a famous artist, Diego Rivera, but more time seemed to be given to her unfortunate physical problems from polio at an early age and a severe accident at age 18 along with her society life in pictures then were actually given to this woman amazing talents as an artist. She did have a life long battle with pain and disability to contend with and used the long beautiful colourful gowns on display to cover her misshapen leg and back. When Frida turned to painting after her accident, she became very proficient at drawing and painting in it’s own right. She was influenced by Mexican folk culture, mythology, buddhism, Hinduism, etc which one can see in her art. Her art was recognised by the likes of Surrealist artist, Andre Breton and she successfully exhibited in Europe as well as the USA and Mexico. The V&A Exhibition did have some of her paintings on display which were most interesting. One could clearly see all this e influences in her life coming together in some of them. The last picture above was of a large installation in the centre lawns of the V & A complete with the flowers she often wore in her hair. All in all, I enjoyed this exhibition, especially knowing that it was rare for it to be allowed outside of Mexico. I have added the information from wikipedia for a more complete picture of this brave and amazing woman. ‘Frida Kahlo de Rivera (Spanish pronunciation: [ˈfɾiða ˈkalo]; born Magdalena Carmen Frida Kahlo y Calderón; July 6, 1907 – July 13, 1954) was a Mexican artist who painted many portraits, self-portraits, and works inspired by the nature and artifacts of Mexico. Inspired by the country’s popular culture, she employed a naïve folk art style to explore questions of identity, postcolonialism, gender, class, and race in Mexican society. Her paintings often had strong autobiographical elements and mixed realism with fantasy. In addition to belonging to the post-revolutionary Mexicayotl movement, which sought to define a Mexican identity, Kahlo has been described as a surrealist or magical realist. Kahlo’s interests in politics and art led to the next stage of her life. In 1927, she joined the Mexican Communist Party, through which she met celebrated muralist Diego Rivera whom she married in 1928. The relationship was volatile and included a year-long divorce; both had extramarital affairs. Kahlo spent the late 1920s and early 1930s traveling in Mexico and the United States with Rivera. During this time, she developed her own style as an artist, drew her main inspiration from Mexican folk culture, and painted mostly small self-portraits which mixed elements from pre-Columbian and Catholic mythology. Her paintings raised the interest of Surrealist artist André Breton, who arranged for Kahlo’s first solo exhibition at the Julien Levy Gallery in New York in 1938. The exhibition was a success and was followed by another in Paris in 1939. While the French exhibition was less successful, the Louvrepurchased a painting from Kahlo, The Frame, making her the first Mexican artist to be featured in their collection. Throughout the 1940s, Kahlo participated in exhibitions in Mexico and the United States. She taught at the Escuela Nacional de Pintura, Escultura y Grabado “La Esmeralda” and became a founding member of the Seminario de Cultura Mexicana. Kahlo’s always fragile health began to decline in the same decade. She had her first solo exhibition in Mexico in 1953, shortly before her death in 1954 at the age of 47. I have been so busy these past two weeks getting ready for the Brighton Arts Festival where I am exhibiting at the Oxford Street Studio and Patcham Arts Artist Open Houses for the month of May. Check out the stiffy bags ready to go. I am taking these this morning to Oxford Street Studio. I’m so glad that my wonderful husband is on hand to lend assistance. Hope to see you at one or both of these venues. I recently returned from a 15 day tour of China with my sisters and brother in laws. My expectations were that I would be going to a polluted country that I knew very little about. I left with the same pollution problem verified but with more knowledge of this ancient colourful culture. Our trip started in Shanghai where we visited among other areas, a silk factory and the Museum of Textiles. The embroidery that women were doing was astounding. They used threads the diameter of a piece of hair to sew beautiful pictures and designs. These would take weeks and months to complete. We then flew to Chongquing, a city of more than 20 million, and had a delightful visit to the zoo to view very active frolicking panda bears who are out enjoying the cool air. I was impressed with the breeding program they have for these animals. There are only 400 left in the wild. We then left on a four day cruise on the Yangtze River. This was most enjoyable as we did not have to pack and unpack each day. We enjoyed trips to bamboo forests which were breathtaking, rides into tributaries led by young Chinese women guides, and we cruised through the three gorges which had amazing views which were hampered by pollution which covered the whole country. Nevertheless one could see the beautiful mountains covered in green. There was construction throughout the country. Many high-rises were being built with over 3000 being built in this area alone, all over 30 stories high. Highways were being built and new bridges over the Yangtze were evident. We enjoyed a tour of the three gorge damsite along with the locks which our cruise ship went through. After disembarking from the cruise, we toured Jingzhou-Wuhan , an ancient city of only 5 million which dated back 6000 years of history. I was amazed by the ancient textiles in the museum we visited. Brocades dating back 2000 years were on display. After this we were put on a high speed bullet train which took us up to Xi’an and the terracotta warriors display. These were amazing considering that they had been partially destroyed by fire over a thousand years ago and were being put back together painstakingly by the Chinese. Each piece was glued back with the same clay it was made with and then covered with the clay wash. They looked totally whole again. They did this for each of the warriors and horses along with the carriages. They have only uncovered part of the huge area which the army is contained in. Some of the pieces were made of bronze. Of course our tour would not be complete without a trip to the Great Wall of China. We flew into Beijing and spent several days enjoying various amazing areas such as the summer Palace, the Imperial Garden, Tiananmen Square, the forbidden city, the temple of heaven, and of course the great Wall. I was surprised to see that some of the steps on the wall were at least 20 inches high. One had to pull themselves along the metal rail climbing these old steps which was quite a workout. My sisters and I climbed about half way up to the third tower Coming down was quite a trial. The view again was hampered by pollution as it was in most parts of the country but especially in the Beijing area. We ended our tour with a night tour of Beijing and their Chinese Market area in the centre of town. They had very high end international brand stores side-by-side with this Chinese market that was crowded with people munching unidentified food on sticks and we even saw live scorpions stabbed on a stick, ready to be roasted. I did not partake in this. We were most fortunate to have an excellent guide with us the whole time. He spoke very good English, was very knowledgeable, and had a great sense of humour. We had a great group of people on our tour which added to the enjoyment. We ended the tour with a flight back to Shanghai and then Vancouver which took a total of 21 hours, ugh. My impressions of China were that of an ancient culture which had changed very dramatically in the last several decades from a poor country to a major economic player in the world. In order to do this, their government controlled everything. Personal freedoms did not exist unless they were part of the overall plan of the government. The people we saw seem to be happy and very proud of their country and its accomplishments. I imagine that the elderly would have different feelings. China no longer has the one child rule. Families of two and even three are common. The environment has taken a huge hit during this rapid expansion. I did not see evidence of birdlife or animals other than in the zoos. Even though China is making great efforts at becoming green and reducing their dependence on coal, they still have a long way to go as air pollution was evident everywhere. I must say that the country was very clean and did not have the garbage lying around that one sees in other countries. They wash their city roads every night in Beijing and they have people sweeping the sidewalks on a regular basis.the Yangtze has been cleaned up with no garbage evident but one could not drink the water anywhere so depended on bottled water. I felt very safe there as there was evidence of the military in the cities. The people were very friendly and often anxious to take pictures of us with them. All in all I am very happy to have taken the trip as I found it most educational to view China’s glorious past along with their beautiful art and experience the way that a their society copes with it’s new way of living. Most of the photos below are self explanatory other then the lovely one with the lady in red which was in the bamboo forest. The cruise ship was similar to the one we were on on the Yangtze River. These first two photos were of one of the incredible hand embroidery pieces found at the museum of textiles in Shanghai. Above is Tiananmen Square, and next is the Beijing city centre with a few police to keep watch. with the Wangfujing market (photo below) which was part of this area. The live Scorpions on a stick were found here. the immediate photo below is of Shanghai which was lovely with it’s modern skyline. This time of year has come around again when I have again submitted two pieces of art to the Royal Academy of Art in London for their Summer Exhibition. Being accepted amongst the 12000 applicants including the professional Royal Academicians has long been on my bucket list. I will never give up. This year I have submitted my mixed media textile work called Sandpippers which is on my website as well as this one which is a painting called First Snow. I would love for a textile piece to be accepted amongst all those paintings, three dimensional pieces and architect submissions. It is always good to have challenges to work toward and goals to follow you into your art. On our recent tour of the south sea islands and countries, we were driving around the gorgeous north island of New Zealand when I saw a sign for Hundertwasser Toilets. I had heard something about this but couldn’t believe that we might see them. Who ever thought they might see an original artistic toilet building in the middle of a small town in New Zealand? Hundertwasser was a famous Viennese twentieth century artist who I studied for my Art and Design diploma years ago. Not only was he brilliant, he was an avid environmentalist. I didn’t know that he had traveled to New Zealand on numerous occasions to stay near Kawakawa on the north island. They commissioned him to design a public toilet building in their main street. Now the whole small town is on the map due to this. I immediately went into the ladies side and started taking photos chattering to myself about the beauty of everything I saw. I am sure others inside thought that they might need to lock me up. Afterward, I had to buy a few items including a 2018 calendar with loads of his art shown. Who knows, a new series of more modern paintings may result. After returning from a long cruise and road tour of the Pacific Islands including Australia and New Zealand, I was surprised at the similarity of carvings done in the various cultures. I am familiar with our first nations and Inuit carvings in Canada. There were similar totem poles and carved heads throughout the islands. In New Caledonia’s Ise of Pines, we were taken to an area where a fence of carved heads surrounded a memorial statue. I enjoyed taking photos of these thinking that they could be included in some of my art in the future. We toured the Maori site in Rotorua, New Zealand. Not only did we see the geysers they are famous for, but they have set up a school to teach the Maori young their traditional crafts. This included carving and weaving. There carving is quite distinctive with much more detail evident. I couldn’t resist showing the above two pictures of the Maori weaving with chicken feathers. I have made textile pieces of portraits including my first one called Gramps. They are not like the carvings above which could be an inspiration for a new theme in my painting and textiles in the future. In the mean time, enjoy my old Gramps piece. This is a departure to my usual textile work as it is created completely with textiles. It has been dyed, painted and torn. It was then heavily stitched by machine and hand. It is now for sale at the gift store of the Audain Art Gallery and Museum in Whistler BC. Recently I offered a long time friend a piece of my art as thanks for being so supportive over the years. 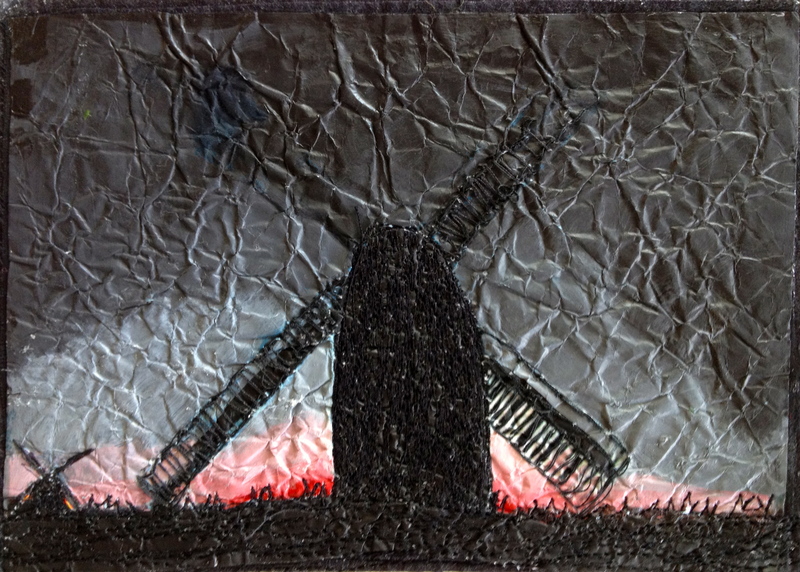 She chose a textile piece called ‘Windswept’. I warned her that it was in an exhibition in Brighton UK and unfortunately for her, it sold. Faced with the dilemma on what to do I decided to paint her a copy. She wanted it slightly larger so this would work well but I had never copied one of my textile pieces as a painting. Using various acrylic textural mediums I think that the texture of the textile has been captured. I especially like the elongated landscape shape. I am pleased with it. I thought that I would post the two pieces for you to compare. Last week I took part in London’s Pintar Rapido plein air painting weekend. This started with all artists showing up at the Chelsea old town hall Saturday to register and then wander around London to find the perfect spot to paint and returning at the end of the day with our masterpieces. These were to be exhibited for sale and prize selection the following day. I was to meet my friend and fellow artist Caroline Marsland at Chelsea after taking the train from Brighton to Victoria station. I was assured that once at Victoria, it was an easy bus ride on a 211 bus found at bus stop G. I spent 45 minutes hauling my heavy art supples around Victoria station finally asking the third bus person where to find such a spot as the Victoria station area is under massive construction. I finally found a small group of people around a temporary marker with 211 penciled in and left for Chelsea. Once Caroline and I got together and registered, we lugged our heavy art bags via busses and the underground to the Tower of London’s dock area. After a long walk around to find the perfect area, we finally started two hours later. I liked the view of the Tower bridge so I decided to plant myself under a large tree near a taxi stand. This was good in that it kept me relatively dry and away from the many tourists which unfortunately hounded Caroline in her chosen spot. It started to rain. I had chosen slow drying acrylics to use as painting out of doors causes ones acrylics to dry very quickly. My slow dryers were so slow that they ran when wet and smudged when taken back to Chelsea in the pouring rain. Neither Caroline or I were satisfied with our results and did not leave our art to enter at the Chelsea art exhibition. I slowly hauled my very heavy load on wheels back to Victoria station and on to Brighton, totally exhausted. Lessons learned were that in the future, I will use my carriart case to secure the wet paintings (check them out on line). I will put my half french easel (much lighter then my full french easel) on a luggage carrier with sturdy wheels along with art materials for ease of travel. I will not travel vast distances across busy tourist laden streets and undergrounds but will check out a place ahead of time and one which is easier to navigate. Lastly, I won’t go out in the rain to paint. So for those of you who wish to experience plein air painting, it can be lots of fun. Painting from real life can add energy to your work. A couple more suggestions are as follows: make sure you are near a bathroom, pack a lunch and plenty of water, and to discourage onlookers, a suggestion from my learned friend Lisa Cirenza, wear ear plugs even if they aren’t on as people may hesitate to interrupt you. Royal Reflections with a Glass of Wine. The Royal Pavilion is an exotic palace in the centre of Brighton.. It is the former sea side summer palace for King George IV and has a colourful history. This historic palace mixes Regency grandeur with the visual style of India and China. It was sold to the city of Brighton by Queen Victoria who undoubtedly was not amused by the antics which her predecessor got up to. The city invited artists to come and enjoy painting on the lovely grounds of the palace and will be posting the resulting pieces on the Royal Pavilion website. My friend Tina Stiles and I took advantage of this and lugged out plein air gear around the grounds in order to find the perfect place. As I had already used the pavilion reflected in it’s small pool in front for a small encaustic piece, I decided to paint that angle that day. I used acrylic paints as it was set to shower and I figured that the plastic in this medium wouldn’t be bothered by a little sprinkle. It did sprinkle so I had to fold up my french easel and head for cover under the overhang of the pavilion to finish the painting. In looking at the finished product, I think that it could have benifited with being looser. Maybe staying in the rain could have been the key. After, we decided that all the lugging of art gear wore us out so we decided to end the afternoon with a wee glass of wine on one of the benches in the grounds. A rather startled tourist from Germany agreed to take our picture. He took one himself undoubtably thinking that he had come upon a couple of happy old artists after a hard day. Last week I sold a medium sized textile art piece,’ Silhouette’, at Patcham Arts, Artist Open House in Brighton. Having brought it back from Canada for this show, I was very pleased with the sale but it did leave a large space on the wall which needed immediate attention as the exhibition is on for the month of May. After a review of my textile mixed media stock, I decided on a piece I had completed a few years ago that was still unsold. It would do in size but it needed to be refreshed. As it was on an acrylic base, I was able to overpaint parts of it adding various mediums to give it a new fresher look. The darker one below is the older piece in need of a facelift. If you are unhappy with a former piece of art, there is nothing to stop you from overpainting it or adding various pigments with varnish, shellac, mediums or resins to change it’s appearance and give it a new lease on it’s artistic life. Yesterday I visited our local fabric store in Whiterock to celebrate the 30+ years of business that Laura’s Fashion Fabrics has been in business. This little treasure sells not only lovely fabrics but unusual items such as expensive, unusual buttons, sewing machines, titanium sewing needles. etc. She has to close at the end of the month to make way for a 24 story high-rise that cannot accommodate her shop. I am saddened by the disappearance of specialist stores such as Laura’s which gives cheerful personal attention to each customer, remembering who they are and giving out free advice on a variety of matters. It has been the meeting place for many textile artists. Shopping on line doesn’t touch this service. With the sale prices in effect I couldn’t resist buying a number of packages of titanium needles for my bernina sewing machine. These little treasures cut through the many layers of paint and textiles on my art pieces like a hot knife on butter. “This project was viewed as an opportunity to produce artworks that will visually help the world understand the stories, hopes and dreams of your residents. Through this understanding we hope to encourage and increase the respect, and empathy for the large numbers of populations migrating in these troubled times. We also aim to encourage hope and personal strength in the residents and children with whom we work, by giving them an outlet for creative expression, and letting them know people truly care about their plight. This would be a two pronged project. LIGCA*( London International Gallery of Children’s Art) volunteers would run an art workshop that would provide the children and potentially their carers to make work expressing their hopes and dreams. LIGCA has learned from previous projects with refugee children that expressing their feelings through art can help them combat feelings of powerlessness, and create a diversion from the chaos and struggle of their daily lives. LIGCA will, at the same time, work with a primary school in London that is keen to connect and relate with the guests at Casa Suraya. The girls at the school will reflect on ideas of hope and kindness, displacement and migration, and all pupils and parents will be encouraged to do acts of kindness and be mindful of them. The second prong of the project would be the portrait work and interviews done by Lisa Cirenza throughout the week. Lisa has found that through giving voice and recognition to the people she portrays – both through her interviews and her artwork – hope and a sense of a positive future can be increased. I arrived in Milano and started to assist with the painting classes. We had a mixture of adult women and children of all ages including an infant. As expected, they were somewhat cautious at first but with time, they started to open up to us and enjoy the painting. The children were very excited to be involved and were a handful at times finding it difficult to control their enthusiasm. I must tell you that very few of them spoke English. Three of our group were fluent in Italian which helped to a degree as many of the refugees were starting to learn that language having lived at the centre for many months. There was a lot of communication through gestures and they got to learn ‘don’t touch’ quickly as they initially would start handling paint and glue before the demonstration had occurred. Their teaching involved the use of acrylic and water soluble paints which were painted on or layered with magazine pictures, fabrics, numerous craft items, and stencils. Lisa was able to photograph many of them with their head silhouettes which they used as stencils onto prepainted surfaces which was especially effective. We were fortunate in having dozens of oversized mens shirts donated to us which were used as smocks for everyone. The little ones looked so cute in their huge smocks. Our group had four days of painting with the refugees. During that time, we saw such a positive change in them. They were able to express themselves through their art, showing great pride in what they had achieved. They would excitedly hold up their art for others to see. They were so appreciative of the efforts made for them and knowing that we cared. On numerous occasions I would have one of the girls come to happily kiss me on the cheek smiling widely with pride in her art piece. Our little group was so moved by these people who have nothing including no country to call their own. I was honoured to be included with the group and will look forward to working on some of the art pieces we brought back. I appreciate the assistance given by the Brighton Embroiders Guild’s young embroiders whose teacher Sue Lacey was able to generously provide me with a package of textiles and supplies which I took with me for use with the refugees. It would be lovely to have the young embroiders stitch into some of their art for a collaboration of international children’s art. The London International Gallery of Children’s Art will be the recipient of most of the children’s and young adult’s work which they will make available to anyone to use to promote education and international understanding. They hope to have exhibitions of the art in the future. Lisa Cirenza and I will be working together and separately on projects involving this art in the future. I left for Milan wondering what life would bring and returned with such appreciation and admiration for the strength and courage of this group of children and adults. What a blessing to be able to make a small difference in their lives. There are a variety of exciting exhibitions at the Victoria and Albert Museum in London. I booked to see two that are on presently with my friend Donna Jones ( www.donnajonesdesigns.co.uk ) who traveled in from Wales to see the exhibition. What a delight and adventure we had. The first exhibition was called Undressed, a brief history of underwear. There were rare old and modern pieces of ladies and mens undergarments, nighties, and downright weird lounging outfits. Many of these were beautifully stitched and embroidered. The corsets set my teeth on edge at the thought of being strapped into something made with whale bones and fixed so tight that ones internal organs were actually squashed in a most unhealthy way. No wonder ladies swooned as a matter of course in those days. The ones pictured below look to have about a 16-18 inch waist! Yeah for women’s lib, liberating us from this torturous clothing (although I do wonder about those towering high heels). The next exhibition was called Revolution. It was about records and rebels 1966-1970. It was a wonderful walk back to that time with many original manuscripts from Beatles,Paul and John, along with their outfits, fashions worn during that time, political activism, historical happenings and music music music. We were given headsets to wear when we entered and as we passed through the various areas, the music changed. This culminated in a huge room surrounded by large screens and surround sound loud music, The flooring was artificial grass with bean bags to lounge on. Yes, we were in the centre of the Glastonbury festival and Woodstock! People were lounging about lost in the thumping music. It was so much fun experiencing the close up clips of Bob Dylan, Joni Mitchell and others as well as speech clips from people like Marten Luther King. I loved it. Unfortunately we were unable to visit the Opus Anglicanium exhibition due to running out of time. We had a snowstorm to contend with! The snow experience in southern England is not like that of Canada. Because snow is so rare, there are few gritters and salters to ease the pain of trying to drive on snow which has turned to ice. When I finally arrived at my bus (booked due to a rail strike ugh! ), it was shortly after 5 pm. We traveled at the great speed of 0-3 mph! After stopping at 10pm for a driver break when we dashed to a store to buy something to eat, we continued on. At midnight I finally arrived at the sea side in Brighton having fallen asleep past my Patcham drop off and five calls from Chris. He came to rescue me, cold tired but very happy with a day at the V&A and a snowy adventure. A belated welcome to 2017. So much has happened in 2016 with my art as well as the upside down things in the world of politics. I shall steer clear of the politics but need to say a thank you for your support and encouragement with my art. I was able to add two Galleries in Canada and have had some success with the galleries and exhibitions here in the UK. Over the Christmas holiday I tackled the daunting cleaning up and reorganising of my art studio. Things were a bit hectic before Christmas so the studio’s organisation suffered. Many things were thrown or given away. I continue to juggle the three areas of art that I pursue. I love doing textiles, encaustic and oil painting and incorporate them together at times. The supplies for each can be a challenge for storage, especially in my small studio. I also have a common problem that most artists wrestle with and that is the art which is produced and where to store it. My patient husband built me a second area for storage which is a small suspension platform hanging from the rafters which is rapidly getting full. Now that the studio is better organised, I decided to start the year with trying to do 5 paintings a week. As two of them are going to be textiles, they are not complete but two of the oil paintings are with a third almost there. Time on the brush or sewing machine is so important so I will continue with this for the next couple of weeks. A surprise trip to Europe to do with art has just been planned and will interfere with the weekly challenge. I will update you on this trip later. In the meantime, here are two of the oil paintings that have been completed so far. I hope that you enjoy them. On November 25th we celebrated the opening of the three week Artist Open House at Oxford Street Studio. The studio which is not large was packed with well wishers and customers. The open house weekends continue for the next two weekends finishing on December 11th. I have been busy creating new works as well as presenting some of my digital art created on my iPad pro. Two of these were inspired by Van Gogh and Monet but the others were my own design. I use my ‘Brushes’ app for most of these but have been playing with the app ‘Art Set’ which has lovely brush like features.These paintings were presented on wooden cradle boards and sealed in resin. I am pleased with the richness of colour and glow from the resin and will play with this in the future using some of the dyes with the resin and embedding some of my textile pieces in it. These photos are some of my digital paintings with resin as well as one of our busy private view. Enjoy and come visit us if you are in Brighton in the next two weeks. After being in Canada for 3 months we are heading back to the U.K.. Lots of good things happened in Canada to do with my art while here. This included being in an exhibition with my Cutting edge Artists group for the month of September, doing a two day demo at the White Rock library in their master artist series , touring the local Artist Open Houses which lead to my introduction to the mind and Matter Art Gallery. I now have three textile pieces accepted by them for sale. To top it off, I enjoyed a trip to Whistler Blackcomb Resort with friends to view the new Audain Art Museum and have had two of my textile pieces accepted for sale in their gift shop. The most precious of all was us being able to tour our daughter and granddaughter around BC and visit with family and friends. Now we are going back to Brighton to see family and friends. I will be continuing with having new art in the Rendezvous cafe and gallery and Jolliffees cafe in the north lanes and preparing for the Artists Christmas Open House at the Oxford Street Studio in Brighton. Hope to see some of you there. Recently I had the pleasure of visiting Whistler Mountain Resort north of Vancouver BC and the newest jewel in their crown, the AUDAIN Art Museum. Michael Audain donated $37 million to build a fantastic structure and then donated his extensive art collection to be housed there permanently. He had scoured the international art world for many of our native art pieces which left Canada over past centuries. It is wonderful to see our native heritage returned here. The large collection of this art is beautifully displayed. I quote from Tourism Whistler’s description of the Audain. “The Museum contains a permanent collection of the art of British Columbia including an outstanding collection of nineteenth century Northwest Coast masks, one of Canada’s strongest Emily Carr collections, a selection of Vancouver’s celebrated photo-based art plus a gallery devoted to West Coast artist Edward J. Hughes. The Audain Art Museum also has the capability of housing many traveling exhibitions. At this time we were fortunate enough to see the exhibition of the Beaverbrook collection which houses many Canadian and international art pieces which was striking. This beautiful art museum is a wonderful addition to Whistler and will be enjoyed by its many summer tourists as well as the skiing public in the winter. I love Hornby Island every time I visit as it is a delightful blend of artisans, hippies,and city folk who want an isolated get away. The houses show this diversity with as they range from small old A frames, cardboard and straw houses to high end eclectic architecturally designed works of art. The people are just as diverse. Below I have photos of some of the homes along with photos of the island and of course, a picture of the old soul at the recycling building and the area for recycling bicycles which is a common mode of transport. Hornby is very proud of it’s recycling and has a large building to offer free exchange on all items plus recycling of garbage. It has an awesome pizza place called the cardboard house serving the island, one large co.op which sells everything you can think of, a few bed and breakfast facilities, cafes and clothing kiosks plus lots of artists and their wares. Opps, I almost forgot the fruit winery which makes wonderful bubbly champagne like wine from apples, cranberries, raspberries, etc. We enjoyed touring the island and its few shops and the winery and ended each evening around a roaring campfire roasting marshmallows surrounded by stunning beauty. Now this is the way to recharge one’s artistic soul. No matter what road you take in life, knowledge of your area is needed to ensure your success. This can be taken through formal education, a shorter course or working with an experienced teacher or coworker. Earlier in my textile arts career, I was fortunate enough to discover the City and Guilds teaching through the Gail Harker Centre for Creative Arts in Washington USA where I achieved my art and design studies and diploma level in Advanced machine embroidery. This foundation in art was a very important stepping stone for my future art. Today I had the pleasure of visiting the graduation exhibition of the Level 3 Experimental Stitch. My friend Wendy Mackinnon was one of those graduating. After 7 years of training, she is ready to take her skills and proceed in whatever area she decides on. Hew work and the work of the others were a reminder of the amazing study required for this foundation and the the foundation is just the start. My oil painting teacher in the UK, Martin Kinnear, has repeated that continuous and daily painting is needed to develop ones skills. This advice applies to any area and is the critical element for the future of success of the artist. I so enjoyed the textile exhibition and look forward to seeing their future work. On September 1st the Cutting Edge Mixed Media Art Group opened the Out of the Box show with their exhibition In Whiterock, BC. I am a long time member of this group.The exhibition lasts until September 30th. My piece called Into the Forrest is displayed at the bottom of the stairs. The textile art displayed is innovative and professional. The exhibition was celebrated with an opening including the Cree Dancer, Shyama Priya along with most of the Cutting Edge Artists and local dignitaries. Shyama performed very colourful native dances and included the audience with some of the dances. Recently I attended a demonstration on the artistic use of resins demonstrated by Aram Friedrich and Rob Jenkins of Eli-Chem Resins U.K.
Aram explained that 95 percent of their business was industrial and 5 percent was for artistic purposes. They have excellent demonstrations on their website listed below which one should review for the detail on how the artistic process works. The use of resin as a painting medium results in a contemporary abstract design. It can also be used to coat paintings and textiles by pouring the clear resin on these surfaces. The colour in the painting is much enhanced leaving the surface glass like and hard. Those who do watercolour were pleased that they would not have to use heavy glass over their paintings if they elected to use a resin top coat. During the demonstration, the class was allowed to make a contemporary design by adding coloured resin, (polymer pigment ink and resin) to a surface. The photos below show how it first looks before some mixing and hardening. The design painted was by 15 enthusiastic attendees so is not the best. It does show the richness of the colours, and glass like finish. I had pieces of my encaustic art covered by the clear resin which enriched the colours. It did take away the texture which occurs with encaustic. I also had a small piece of stitched textile covered in clear resin. I loved the increased richness of the colours. As this piece did not have much stitching, it tended to look like lines drawn instead of stitched but more research needs to be done with more heavily stitched pieces. Finally I had oil and acrylic pieces coated with clear resin which enhanced the colours. With the acrylic piece, I had them add a blue resi blast mixture with resin. This resulted in a pieces that glowed blue in the dark which was fascinating. I am going to try my hand at some painting with the resin for a more contemporary design piece of art. It won’t take the place of my love of oil, encaustic and textile but could be fun to explore. This was the class attempt at painting with resin. The colour is great but design a bit muddled. This was my acrylic piece which had the rest blast painted on. It look clear during the day but glows blue in the lighter areas in the dark. There is a small pond in front of Brighton’s beautiful Royal Pavilion. I have been trying to obtain just the right light for a photo reflecting this impressive structure. I have painted a similar picture in the past but wanted a different view and lighting so went off early this sunny morning and was able to obtain several photos. Note the different colours, shadows and textures in the pool. I am going to paint further versions of this view incorporating these details. My former painting of this has been sold but I have included a picture of it. Keep posted for the new one soon. In the meantime,enjoy the curves and turrets of the pavilion. Yesterday I had the pleasure of visiting and spending the day at Royal Ascot with two girlfriends. As we were in the Queen Anne enclosure, hat and formal dress were mandatory. Now my artist eye was in overdrive with all the feathers, curls, and textiles on the heads of bejewelled ladies. What colour there was to behold! I didn’t fully realise the importance of hat design as a creative art until then. I should like to use some of the unusual colorful shapes in some of my textile art in the future – spirals with a twist. As an avid royalist, I was in heaven and amazed by the casualness of having these illustrious royals wandering around us. Yes, they had plenty of tall hatted gentlemen close by but it was such a treat to see the Queen, Kate the Duchess of Cambridge and William, Princes Anne and other royals looking so relaxed and in their familiar surroundings. The horses were, as always,splendid and the whole Ascot area was such an impressive design. One could get right up to the finish line to see ones’s horse gallop past. I was fortunate enough to hold winning tickets for each race and turn my £2.00 bets (big spender) into a profit of over £60.00. All in all it was a day to remember. I loved the artistic presentations on tottering legs, the horses and my time with two friends. Most of us take our ability to see the colours of the rainbow for granted. We need to treasure this ability. Recently I was chatting to my nephew Kaleb who commiserated about his inability to enter various vocations due to his serious colour blindness. Vocations such as the police work, electronics, and others professions reliant on ones ability to differentiate between colours are barred to him. As an artist, I treasure my ability to see the many colours involved in the making of paintings, textiles and all other artistic pleasures. In the past few years, I was diagnosed with cataracts which I shrugged off as something that would need to be dealt with in the future. I did notice that I struggled with reading street signs from a distance, reading in dim light, and noticing that things seemed a little dull and blurry. In my eye test this spring I was told that I should do something about these pesky problems. I proceeded to arrange for both eyes to have the cataracts removed at the same time with varifocal lens implanted freeing me up from wearing glasses. The surgery which was quick and painless was yesterday. WOW is all I can say. The whole world is so much brighter with wonderful saturated colours. The surgeon explained that cataracts are a muddy yellow in colour painting ones world in a soupy yellowish sort of fog. Well the fog has lifted and what a delightful difference. I now have the dubious work of reviewing some of my past paintings to assess the colours I chose for them. It will be fun to correct them as needed. I have two versions of the same photo below using a filter and no filter so you can get the idea of how colour can be changed by cataracts. I believe that colour blindness would have even a more marked effect on these results with greys being more predominent. Treasure your sight and enjoy those wonderful colours! Recently I returned from a 5 day trip to New Orleans with my three sisters. We timed it to correspond with their music festival and boy does that lovely city shake with music. There were at least 12 large stages set up throughout the French quarter with music being played and sung from sunrise to sunset and beyond. One heard all sorts of music from traditional jazz, to vocals that hummed with the Caribbean influence. On most street corners one could find musicians singing and playing various musical instruments. It was magical. In our spare time, we four took a water tour around the beautiful Mancha Swamp and Bayous in the National park and Wild Life Preserve. Here we saw dozens of American Alligators of all sizes. Our captain showed us one that was handed around to us. He explained that the young alligators had a 20% rate of survival to adulthood so he kept one for about a year, feeding it and showing it to the tourists. By then it had reached a reasonable size so not be eaten by birds and other animals.He then released it. I was able to hold the little guy whose name was BRUCE! We also included a Plantation Tour that day and were delighted to see the beautiful Oak Alley Plantation. The house was beautiful and the small houses for the slaves were sobering. The approach to this huge home was through huge oak trees which were hundreds of years old. Not to be missed was the cajan food. We tasted alligator (like Chicken), jumboli, crawfish pie, gumbo, and spiced beans and rice. These of course had to be cooled down with mint Juleps. This get together with my sisters was so much fun and unforgettable. It filled my inspiration needs to the brim. Working in a series can help one to develop and expand an artistic subject. One can take differing views, colour combinations, times of the day for Landscapes, included objects, animals or people, etc. I am working on series on the iconic South Downs in the South East of England. These lovely rolling chalk filled hills are home to many farms raising sheep and cattle. Their famous white coloured cliffs are found all along the coast and include such well known areas as the Seven Sisters and white cliffs of Dover. I have decided to initially use various mediums including oil, acrylic and encaustic painting. I will also explore this theme with work in textiles later.It will be interesting to see similar images expressed with such different mediums. I hope that you enjoy these ones which were painted using encaustic and pigment. Worship of the Mother Goddess is a purely Vietnamese folk belief. It has a long history and has adapted to social changes over the centuries. Today this belief is widely practiced throughout Vietnam and in Vietnamese communities around the world. Worship of the Mother Goddess addresses the concerns of daily life and desires for good health and good fortune. Worshippers find emotional support in their belief, and it attracts followers from all strata of society. Mother Goddess worship encourages purity of heart, beauty and joy. The four colors associated with Mother Goddess worship are Red—Palace of Heaven, White—Palace of Water, Yellow—Palace of Earth, and Green—Palace of Mountains and Forests. We all have goals in life and one of my artistic ones was to have one of my paintings accepted into the summer show of the Royal Academy of arts in Britain. Well when I arrived in Canada a few days ago on my semi annual visit, I received not one but two emails from the Royal Academy saying that both my paintings have been accepted into the second round of judging. I am royally chuffed (an English term). Even if I don’t get further on, this is a winner for me. It is good that my husband has remained in England this time so he can take the paintings up to London for judging. I had the pleasure of visiting Kensington Palace yesterday and viewing the show on dresses of the Queen, Princes Margaret and Princess Diana. The drawings of these gowns were also displayed by their designers. One doesn’t realise what artists the designers were in their own right. Their drawings were tasteful and appropriate for their clientele. As famous designer Hartnell put it, pictures for the queen to view could not be to royal looking and not to high fashion, just a perfect blend of the two. I couldn’t help but take photos of Princess Diana’s gowns as they were exquisite. In the background you can see some of the dresses from the 50’s and 60’s for the queen and princess Margaret. Enjoy. What a wonderful tour we had at London’s Royal Academy of Arts newest show, ‘The Modern Garden, Monet to Manet’ on January 27th. I enjoyed sharing this with friend Carolyn Marsland who is an art instructor so what better person to have along to drool over these exquisite pieces. As this was the day before the public was allowed in, we were able to have breathing space while we enjoyed the many artists. I have been an admirer of Monet for many years and have tried to paint some of his works as a training mode for my oil painting. I have also seen his wonderful house at Giverny in France and many of his works there but this show brought together many pieces which are privately owned and have not been shown together before. As Monet aged, he was more home bound then before. Having a lovely large home and huge walled garden as well as a small lake he developed, he was able to concentrate on his love of painting his garden and beloved water lilies. He painted in a series so was able to fully develop this area of his art. These were mesmerising to see and the art he produced from them was amazing. The most awesome piece was at the end of the tour. It took up one large darken room and was made up of three huge panels of waterlilies he painted during and after the war. After his death, his son sold these in the early 1950’s. Unfortunately they were separated and went to three separate museums in the USA. This was the first time that they have been shown together in Europe since being separated. The advertisement for this show shows these panels. I was able to sneak a quick photo(no flash) of a portion of the panels which I treasure. And now to try my hand at painting some of these…. Welcome into 2016. I am a little late to raise a glass with you as I have been working like a beaver to get these two pieces finished for an upcoming spring exhibition with the South East England Embroiders Guild. It is being held at the National Trust site at Standen House and Gardens which is famous for it’s Arts and Crafts designs by William Morris. We visited the house last November for inspiration. November gardens in England are less then perfect so another trip will be planned later this spring to see the exhibition and the gardens. I hope that the gardens have not been adversely affected by all this rain and flooding that we have had in England. I will keep you updated. In the meantime, I hope that you enjoy my little pieces of Arts and Crafts inspired textiles. Alice in wonderful Canada land is happening. This will be the most well traveled textile piece I have produced. After her successful tour with the embroiders guild in England, she became available and was immediately sold. Thank you Nairn. I hope you enjoy her as much as we did. In the past month I have been working furiously with painting numerous encaustic paintings for a new Christmas Artists Open House at the Oxford Street Studio. The studio has never been involved in a Christmas open house before so we didn’t know what to expect. I love the location of the studio as it is just off the busy London Road shops in Brighton so I hoped that footfall would be there for any Christmas shoppers. My plan was to just show encaustic work and to have the frames either in black or white. I also displayed pieces with a variety of sizes and prices including some unframed original pieces which were in my browser. I also had some small items such as felted soaps and cards available and thought that I would try to see how my eco printed silk scarves would be received. Well, after the first weekend it appears that my plan worked. I am delighted to have sold seven paintings as well as various cards and felted soaps. It is interesting to note that although the silk scarves were admired none sold. We have two more weekends that will be opened so I am working to replace some of the smaller more popular paintings as half of them have sold. I continue to learn about the selling of my work. The number one item of importance is that one needs to be in a good location for buyers. It doesn’t matter how good your work is, if there are few people around to view your work, your sales will not be robust. Now I just need to continue to build that all important client list. I wish all of you a happy healthy and prosperous Christmas. Back in the UK, I enjoy thoughts of the mountains of my British Columbia home. This little piece of encaustic art was a playful way of remembering. It was created with the oil/wax sticks of encaustic and applied with an iron and stylus. It was recently shown in the Dupont Art Club annual art exhibition. I also have just finished my large piece ‘ Into the Forrest’, and took it along to display as well. it is going into a show next September here in White Rock which I will advise you of closer to the date. I enjoy my oil painting very much but working with my textiles is much more tactile. Both are very rewarding. It has been some time since I wrote about this commission. A family wedding and travel in Canada has kept us busy. I was given a colourful whimsical card by Judi. my neighbour as a inspiration not to be copied. . A preliminary sketch was modified to include a dry stone wall and via duct. With numerous changes,I completed the final acrylic painting, crunched it and bonded it to canvas. I decided to add various materials in a collage fashion and am nearly there now. A final photo will come on my future blog. So far I have spent about 40 hours on this piece. Textile art is much more labor intensive then painting. I have a commission to make one of my stitched paintings. My neighbor in Canada loves the Yorkshire dales and their dry stone walls in the UK. She has asked me toi do a piece for her with this subject. Fortunately she brought some cards back for me to see what type of piece she would like. Having never been to this beautiful part of the UK, i had to depend on the internet and her cards to give me ideas for an initial sketch. I made four rough sketches for her to chose from. It will be interesting to see what she chooses. I have attempted to put these sketches in using my ipad bu alas, i can’t figure out how to include them. My computer is in Vancouver and we are in Penticton, in BC’s wine district at present. I included another finished piece using this technique so you can see a finished piece using this technique. You will likely recognize this from Monet. What a treat to be on a one week oil painting course with my favorite instructor, Martin Kinnear and a jolly group of nine other artists. Martin and his assistants have us roaming the hills and beaches of this beautiful part of England. After four days of continuous painting, I sure notice an improvement with my painting skills.. I love it. One day left and we return to Brighton to get ready to fly to Vancouver Canada. For now, i am looking forward to our last day here tomorrow. It is has been an excellent course. This was the quote that welcomed us to the four day summer school with the Textile Study Group. Our instructor was Mary Sleigh who is a long time member of this 25 strong group of professional artists and teachers. It is set up as a time for artists of all walks of life to come together to take one of three classes given. Each class is limited to 16 so you can see that early registration is required. This year we had our summer school at the Farncombe Estate near the village of Broadway and the city of Oxford UK. It is a 1500 country acre site with many different places to stay and many things to do. The food was delicious and plentiful. I was a bit dubious about the content of our class initially as my interested lie more in painting and drawing which can include stitch. Mary talked about making books and boxes. We also learned about paper folding. As it turned out, I had a precious piece of rusted fabric with my late father in law helped me with through a loan of a can of rusted everything. I was able to build a lovely book witch I will keep as a sign in book for my art shows. So what else did I learn from this unusual turn of events? Firstly it was not to be too hasty in passing judgement on content when I don’t know the full extent of what is to be taught. I refreshed knowledge I had gained years ago with my training at Gail Harkers Centre for Creative Arts in Washington. I also gained many little gems of information to do with my passion of art. I learned how to make my own gesso the way the old masters did with rabbit skin glue, I was able to see what the latest books and tools were when the mobile Art Van Go van with Kevin came for one day to quench our desire to buy the latest things on the market. Lastly and most important was the interaction with so many professional artists who like me came to have a break where they could just learn and play with art. Recently we had the pleasure of visiting the Champahne District in France. Now I know that Champagne is a title restricted to just those vinyards in the Champange District but had no idea on the depth of history surrounding it. This included the discovery of the process by the monks, the fight for survival at the turn of the century to save the vines from distruction from a virus only to be saved by grafting them onto vines from America as well as the deep tunnels into chalk where their champagne is stored. We found a delightful vineyard hotel to stay at where we were plied with multiple tastings before dinners all for free. The Domaine Sacret in Ay was a wonderful place to stay to start our touring. We visited the tunnels beneath Mercer Champagne via a small train that took you around the miles of tunnels, art carved into the chalk and storage racks. As it was very hot outside, we enjoyed the coolness of these tunnels and the tastings after. Of course, a quick visit to Moet Chandon was a must but their main establishment was closed for renovations so we visited their shop which was very expensive and viewed their wonderful visitor centre in Epernay. Being the early bird of the group, I enjoyed morning walks among the vineyards on the hills overlooking at the miles of great waving grape vines. In our recent holiday to France, we were taken by our friends Eve and Dave to Reims to see their magnificent 12th century Notre-Dame Cathedral. It has a wonderful panel of stained glass windows by the 20th century impressionist painter, Marc Chagall. The cathedrale was badly damaged by bombing in the first world war including the lose of many of it’s ancient gothic stained glass windows. A few of these have been replaced by more modern ones. Marc Chagall made these in 1974. You can immediately see the difference as the new ones are a blaze of brighter colours with larger pieces of glass in the panels in a more contemporary setting. .
Eve knew that I loved his work as she had taken me to a little known village in Tudley Village in Kent. There stood a precious little chapel out in the middle of the country, open for visitors to view it’s precious windows by Chagall. When we drove to the Tudley Chapel three years ago, we were surprised to find it entirely unoccupied and open to the public. Apparently there can be occasional bus load of tourists arrive but thankfully not when we visited. One of the wealthy parishioners lost his 21 year of daughter who drowned. He commissioned Chagall to replace all of the wee Chapel windows to honour her life. It certainly has done that. I found the peaceful quiet of the Chapel bathed in the blues and golds from these windows, It was a spiritual experience just sitting in the pews gazing at these magnificent windows. I noted that Chagall was commissioned to also do a set of windows for the Art Institute of Chicago and the UN building in New York as well as a few others around the world but nothing can compare with sitting in a wee chapel in the middle of Kent, bathed in the sunlit colours of his genius. We have just returned from a wonderful trip to France. I have had a visit to Monet’s garden on my bucket list for years and it sure didn’t disappoint. Wow is all I can say. I can see why he had seven full time gardeners. There were acres of flowers and then you came to those famous water lilies. They were the most exciting for me. The small lake was full of them in bloom and there was two bridges he painted. Yes it was crowded but not problematic. We were there in the heat wave hitting the UK and Europe but the lake was surrounded by forest so the heat wasn’t a problem. I am so excited by this beauty of Giverny that I am going to do a series of oil paintings using some of my photos as inspiration. Stay tuned in the future to see the results. These are just a few of the dozens of pictures take.They include the lovely villa we stayed in. Kathy Anne Whites column of june 2015 had an excellent quote from the blog on ArtsyShark by Caroline Edlund. It concerned the topic many artists struggle with in finding their own voice. I found this enlightening and aspirational. I hope that you enjoy and find this information helpful. This is not only true in sports, it’s true in almost everything especially in art. Artists ask me all the time about-finding their voice. My first thought is they have to want to do the work. Many times creatives travel from one workshop to another learning some great techniques, but never work it enough to make it their own. In the 90’s a truly great artist gave me great advice. Learn a technique- go back to your studio and work it over and over and over. Do a piece and another and another and another until what you learned evolves into your own work. The first year after that advice I created over 125 pieces in my first real series. That was the beginning of an inspiring and eventful art career. Recently i had the pleasure of reading an article about self critiquing ones art by Susan Purney Marks. She included several articles which i found very helpful and will repeat below. We often wish for feedback on a piece of art in order to improve it or just to confirm that we are on the right path. We can do much ourselves by using such techniqes as photographin the piece in different sizes, turning it around, standing back from it during painting, etc. You can see Susan’s blog at susanpm.blogspot.ca Two of the articles i found quite helpful are to be found at the following addresses. i hope that this information will increase your confidence and improve what you produce by using these techniques of self critiqueing. Edge of the Forest Exhibition coming to BC! I am delighted to announce that the traveling Canadian Textile Art show with the Surface Design Association is coming to Alberta and BC next year. At present it is traveling in Ontario and then to Newfoundland in the fall. Many of the pieces have been created by BC artist members. My piece called Aspens is included. The dates for the exhibition are as follows. Edge of the Forest is slated to come to Western Canada in 2016. This is a painted and stitched piece which has yet to be juried into an upcoming Canadian show. Yesterday was the opening of the Ascention Arts and Patcham Artists open houses where I have work on display. The private views were on Friday night which meant dashing from one to the other to attend both which was just a little hectic. I have yet to invigilate at both these places so look forward to seeing and chatting to the artists who will also be there as well as talk to the general public who like to see the artists whose work the are viewing. These two venues have yet to be on an artists trail and are a little out of the way from the rest of the open houses. Footfall was not great last year despite brilliant work being displayed by many artists. Next year we hope to join a local trail in our area which should make a difference. Lots of advertising is in place so we still hope that more people from the Brighton area will find us this year. My last open house, Oxford Street Studio, is well located in the busy London Road Shop area. I spent the whole day there yesterday where I have my encaustic work. There was an opening party which was from 1-7pm. I am very pleased that 3 of my pieces have sold. It makes a huge difference on where ones location is for sales of work. Footfall is critical. You may have the most wonderful art work but if there are not enough people through to see it, sales will be slow. I once had advice from a business associate about opening a business. His first piece of advice was Location! Location! Location. I may add that lot of advertising, especially on social media helps. Here are a couple of photos of this opening party and my wall of encaustic art. A visit to the Royal Albert Hall has been on my bucket list for some time. I took advantage to see a wonderful dance theater production of the Follies which was only being shown for one day with two shows. We went to the matinee and enjoyed a walk through Hyde Park which was magnificent with its glorious color of flowers expertly designed by a wise gardener.We passed the Diana memorial which I found sensitively designed with people in mind who loved her and could come and soak tired feet in the waters. On we went and I first noticed the tall spire of the Albert Memorial which stands in front of the Royal Albert Hall. Then we entered into the hall itself . Its splendour was everything I expected. It was bathed in rich of golds and scarlets with its tiers of boxes where one could enjoy the hundreds of shows that occur there continuously. All in all, I was in awe of the many artists including architects, garden designers,sculptures, actors, dancers, etc who added to the pleasure of the day. The Brighton and Hove Arts Festival begins the second of May and continues for the whole month. During this time there are all sorts of artistic venues with dance, concerts. plays, etc. There are also hundreds of Artists Open Houses throughout the area which are open on weekends for one to enjoy. I am fortunate to be involved in three of these during the month. I will highlight each as they open. My first open house is with the Oxford Street Studio located just off London Road Shops area in Brighton. We have a Brighton theme to the show. Nick Ford is the proprietor and has opened his studio to three painters who include Caroline Marsland, Kate Greenaway and me. Claire Dines will show her pottery and Nick along with Rachael Williams and John Nutely with be displaying their photography. It should be a fun time for the group of us and will include demos by the artists. The show opens weekends starting on May 2nd and ending May 25th. We are having a studio party on April 9th all afternoon and into the evening so come and join us. I am specifically showing only my encaustic art. For those of you wondering what this is, well just imagine taking hot wax and mixing it with pigments and heating it onto boards or even papers. Below I have several of the Brighton scenes which will be for sale during the show. I hope to see you there. My sisters and I enjoyed a few days in La Connar, Washington’s tulip festival which was so colorful and stunning. It is an inspiration for art. Unfortunately when we got back home here in Vancouver, we discovered that my email has been hacked. Please ignore the requests for money from any Ukrainians or aliens. Sorry for the inconvenience. We recently returned from a one week holiday trip to Las Vegas in the company of my sister Pat and brother in law Gord who acted as our tour guides. My husband had never experienced the place and was blown away from this unique experience which he described as over the top but in a positive way. Las Vegas is a huge fantasy town built on its gambling initially but is now a huge artistic extravaganza. The massive hotel resorts have not spared expense to put amazing art not only in their architecture but in their internal decor which changes with the seasons. The colour, design, uniqueness, and splendour of it was jaw dropping. Around every corner were delightful surprises. Some examples were the amazing marble inlaid floors and walls, a full sized live flower petaled merry go round in full operation, man made mountains with water falls and even an original Henry Moore sculpture sitting comfortably in the courtyard of the Aria. Of course there was the volcano which erupts hourly at night from the front of the Mirage and dancing waters in the lake in front of the Bellagio. There is even a new huge wheel called The High Roller, which is larger then the London Eye! The crowds were thick at night and very colourful with many characters in dress. My sister and I took an elevator down one floor with three Elvis impersonators. Many costumed people were posing for us to take a photo standing beside them for the price of a tip. My sister and I were amazed at the opulence of the washrooms in these resorts and decided to rate them. This will be discussed in another blog. My favourite had textile art in the washroom which I was delighted to see. I haven’t even begun to talk about the amazing choice of famous entertainers who appear nightly in the shows on offer which we would like to return to see. It is also a shoppers paradise with every high end shop available. The food was eye popping with ten foot cakes. We were fortunate to have pleasant temperatures in this desert town. All in all, we had a fun, entertaining and educational week in wonderful, crazy colourful Las Vegas! I have just finished a two day demo/art show under the Master Artist umbrella for our White Rock library here in Canada. Being put under a master artist umbrella was humbling when looking at the company that I shared. I had two school classes to teach aged 8 and 11 and was given around 30 minutes each. I therefore designed small painted layered cards for each of them to layer with threads, textiles and sequence, all to be glued on. There were to be no needles as they had no experience with stitching and in that short time, safety was a factor. The classes were a resounding success. The 8 year olds were appreciative and so sweet. They produced lots of fun art and I was given hugs by some. The 11 year olds were quite noisy and one could tell that the hormones of teenage years were already in evidence. They seemed to like the experience and produced fun pieces as well. My wonderful nieces and families showed up for sessions as did many friends and adults in the library. All made their own little piece of original art which they signed. It was such a rewarding experience to introduce so many to playing at art. I hope that the adults and children would have enjoyed their experience with this and will go on exporting such a rewarding pastime as art – or perhaps a future artist may have been among these happy little souls. This year marks the 150th anniversary of the writings of Alice in Wonderland by Lewis Carroll. This much loved book has taken many a child and even adult into the magic land of rabbits, mice, cats and more. What a grand imagination Lewis had. Do you remember pretending stories as a child? Hold on to that curiosity for it will enrich your day to day living. As part of a piece for the Brighton Embroiders Guild, I was asked to do the centre piece for a show to be held in Ardingly in June this year. After pursuing copyright free photos of Alice, I enjoyed making this piece. It is 20 by 24 inches so took many hours of painting then stitching to complete. I must admit, I had visions of pink mushrooms dancing in my head by the end. A few days ago we had the pleasure of attending a 72 birthday party at La Cave a Fromage in Hove. it was the first time that I had attended a party in a high end cheese shop and it certainly won’t be the last. Wonderful cheeses from around the world with wine and accoutrements were part of the celebration for my friend actress Carol Cleveland of Monty Python fame. Carol invites friends from many walks of life to these parties but I find it fascinating to meet many of her professional actor friends who continue to work actively in their profession. I find them full of joy and energy and the love of their chosen work. I so enjoyed my conversation with actor Bruce Montague who has appeared many times with Vivian Leigh, acted along side of Topal in Fiddler on the Roof as well as many more during his long life of acting, His strong features begged to be photographed and later I will have fun painting a portrait from the photos for the shear joy of it. Art comes in many forms. Film and stage are just one and a fine one at that. It is not just the actors but the thousands of people behind the scenes to make this magic happen. My nephew David is involved with film as a boom man and taking still photographs of the scenes. I hear from him of the rigours of shooting film in adverse conditions in the depths of winter in Alberta Canada and marvel at the commitment of these people to ply their profession. My sister Faye has just published her first book called ‘Sixteen Chickens on a Trampoline’ after many years of gathering information for it. Good art in it’s various forms doesn’t just happen, it is the result of much work and commitment. I have included a photo of Bruce with Carol in the background. I also added an unfinished piece I am working on for inclusion in the Embroiders Guild show in Ardingly Sussex, UK in June. It is in celebration of the 150 anniversary of the writing by Lewis Carol of his book, Alice in Wonderland. Ahh, we have survived Christmas celebrations and set out for a walk in the country lanes surrounding our family’s home north of London. It is late December and the land is resting from crops. Only a few birds welcome us but on the horizon walks a vision of a typical English horse woman hacking out on her beautiful mare. Given permission, I snap a picture of this peaceful scene. Turning the corner, another pony gazes at us curiously as he munches though some ivy in the hedge. He too poses for his picture. I have loved horses all of my life and have had the privilege of being able to ride for many years. I love capturing images of them in my art. I loved the way that this animal caught the imagination of even our most ancient relatives with their cave paintings. I captured a little bit of this in my small encaustic art piece which I called ‘Cave Pony’. Escaping the winter weather was a treat for us and what better way then venturing to some place new which is sunny and warm. So it was with our trip to Tenerife in the Canary Islands. Little did I expect to see the remnants of the ancient volcanoes and piles of jagged lava beds beside the road side. On our second last day we took a tour of the island and viewed the back for the caldera and the various volcanos and ancient plug in the centre. As an artist, I was mesmerised by the shapes that nature had hewed along with the clear light and colours. How to give credence to something so grand would be difficult. The pictures speak for themselves. Also on the tour we stopped at a huge Christmas group of nativity scenes in an old village. I was delighted to see a model set up with an ancient winding wheel and balls of wool. So thats how they did it way back then. Now we are back in the UK and preparing for a family Christmas. Best wishes to you all and may you have a healthy, happy and prosperous new year. Here we are having s warm sunny break in Tenerife on the Canary Islands which is just off the coast of Africa at 23 degrees from the equator for you folks who may wonder. I had no idea of these facts until yesterday afternoon and evening when we took a volcano and star gazing tour of one of their main volcanos, Mt Teite. This volcano is smack in the center of a huge ancient volcanic caldera which still is surrounded by various extinct volcanos and the huge volcanic plug from the ancient one. It is compatible to yellowstone park but I don’t think that it is as big. We drove up this harrowing twisting cliff hanging road through an ancient pine forest. We stopped at a viewing place to watch the sunset complete with glasses of champagne. That was welcomed after the journey up. They then drove us to a lovely restaurant for a yummy dinner and then back in the dead of night to our viewing area where our guide issued blankets and gave us a lazer star tour of the amazing sparkling heavens. Mt Tiede is an international protected area as well as a no fly zone for all world aircraft due to the interference with the many observation stations. It has no light pollution and one of the clearest heavens in the world for viewing the stars. At the top viewing area were ancient lava fields including a newer one that occurred out of the side of the volcano in the late 1700’s. I wanted to sit and draw some of the amazing shapes and colors during this trip but it will have to wait until a return trip another time next year when we will rent a car and drive up here for the day. The many photos will have to suffice for now. We have been to yellowstone national park which I think is one of the most awe inspiring places on the planet. Mt Tiede is awsome but in a different way as it boasts its link to the heavens. Last week on our way back from a Christmas present run to St Ives for our daughter and grand daughter, we stopped by Wells in Sommerset Uk and stayed with friends for a couple of nights What a treat we had in a trip to Bath for a night at the theater, a trip through their Christmas street fair and of course, I needed to see the Bath Abby again. Bath Abbey is so magnificent with its soaring roof which is a work of art on it’s own. I was so pleased to see an alter font made by the famous textile artist Jane Lemon. She is a superb textile artist and has her own group of expert embroiders to produce her designs. She has stunning work in many of the abbeys and Cathedrals throughout the UK. I was able to take the pictures as well as one of that stunning roof. Artists work with the darndest materials. I think that the most unusual of late was artists making a pot full of jelly on a flat tray, painting it with acrylic paints and taking contact prints from it. Being a desert person, I would have likely added cream and dug in but no, one must not eat this but play with it. Thankfully a new product has been around for a few years called gellipad which takes the place of this tray full of jello. It is a firm jelly like feel and is lots of fun to make all sorts of designs with. I took the opportunity to host two of my art friends for lunch avec vino and then taught them a few of the finer arts of the gellipad in my studio. We had a very fun messy time and the wine certainly helped. One of the friends, Carol Cleveland, was under pressure to produce an art piece for a charity show as she is rather famous being the only woman in the Monty Python group. Away we tackled art with the gellipad and she was able to produce an interesting abstract piece in a few hours which she is going to submit. Her cute little dog, Talula supervised us in the studio. What ever walk of life you tread, it is often the case that a short influx of new ideas or a repeat and refresher of old ones can be just what you need to get going. We have all faced times when we struggle with blocks, be it a writer’s block, artistic, or day to day living. You can always pick up something new that you can take with you with this type of refresher. It was that way it was with me yesterday when I took a short textile course from a friend and fellow textile artist, Arthur Ridley here in Brighton, UK. He gave a one day course involving a transfer inks on a synthetic fibre called Texture Magic. Even though most of the information was known to me, I discovered new ways to put things together and new materials on the market which changes with innovations in the textile industry. It also gave me a little boost to produce. This cute little sample is pictured below. Try something new or old and give yourself a little buzz of inspiration. A few days ago, we visited the fabulous former country home of the famous writer Rudyard Kipling. The house, called Batemans, is located in Kent, UK. and was given to the National Trust by his daughter many years ago. The house is very large surrounded by beautiful gardens. In touring the fully furnished rooms, filled with his belongings, I spied a beautiful tapestry done by William Morris who Rudyard was friends with. The National Trust has volunteers in each room who tell you the history of that room. It is a lovely way to make everything come alive. I learned that Rudyard was friends with dozens of famous people including artists, politicians and writers. Former prime minister, Stanely Baldwin was his cousin. His family was well connected but his dad, an artist, and the family were not wealthy. Kipling made his money through his writings. After his only son was killed in the first world war, Rudyard become instrumental in setting up the International War Graves Commission which tends all of the graves across the world where ever soldiers of the wars are buried.Two of the rooms in Batemans housed an exhibition on this. It was such an interesting place to visit. The gardens will be lovely next spring so another visit is a must. A few days ago I treated myself with a trip to the Knitting and Stitching show at the very impressive and huge Alexander Palace in London. This yearly show is absolutely packed with impressive displays of contemporary textile works from artists who are from around the world. It also has ongoing workshops for the four days that it is on as well as hundreds of exhibitor booths from a broad spectrum of textile manufactures. Thousands upon thousands of people attend each of the four days of the exhibition. Upon arriving I was happy to bump into a long time friend and textile artist, Ruth Issett who was waiting for a visiting group from the USA and Canada lead by my former teacher, Gail Harker. It was a pleasure to briefly see them both again although the pressing crowds necessitated only a brief meeting. At the entrance to the show stood a huge life sized gazebo which was completely knitted by some very cleaver local people. I was amazed at their talent as knitting has always been a skill that escaped me. I had to take a couple of photos of this lovely structure complete with it’s love birds. These large shows are candy to an artist. One gets to see what new avenues textile art is being taken as well as getting the opportunity to network with fellow artists. One also gets to stock up on supplies and unusual items that you can only find at these shows. Aching feet are the only casualty at the end of a long day. Having goals in life gives you something to strive for, to look forward to each morning and to celebrate once these are achieved. The goals can vary from losing weight, which is a perpetual one with me, to learning new skills, traveling to new places , etc. When I lack inspiration to paint or do my textiles, I find that having deadlines for gallery openings, art shows and juried exhibitions can keep me working furiously. Recently I had a piece called Mended accepted for a future show in BC, Canada with the Surface Design Association. It is a whimsical piece called ‘Grandma’s Magical Stories. (Lions & tigers & bears. Oh My!). It is posted below. Another piece for the same association has just been sent in to be juried so I hope that it is successful. It is for Canada wide members of the SDA and I called it Aspens. I hope that you enjoy these. i would love to hear about of your artistic goals. I have a few pieces including oils, encaustics and textiles, going into a show at the Paul Badham Gallery in Haywards Heath in East Sussex, UK. The opening is October 4th at noon which should be fun. All are welcome. Today I enjoyed a at the regency house in Brighton on silhouettes which were all the rage in regency times. We were shown two machine used in past times to help produce these lovely pieces. They were also painted as well as cut out of card stock. Hand in hand with the silhouettes was a stunning show of regency high fashion gowns with corresponding silhouettes to go with them. When photography was discovered and developed, the silhouette drawing was no longer used to make inexpensive photographs for the rich as well as the masses. All in all, it was an educational day looking into paper and fashion art in regency times. Since my last blog, we traveled later then usual to Canada due to the death of my father in law. We traveled to the Calgary Stampede for pre booked events with friends from England after which I attended the encaustic camp in Seattle Washington. As I paint with encaustics as well, this week long immersion in them was a treat. Part of our week included a trip to Seattle and a visit to the studio of Willow Bader. She is a professional artist who paints large pieces in encaustic. I loved to see the result of this medium at the hands of a painter who painted almost in an impressionistic style. I have included a picture of her studio and some of the many paintings which she had there. Later when we returned to England, I attended a three day oil painting course on light and atmosphere with my favourite oil instructor, Martin Kinnear. One of the still unfinished pieces is below as well. In between times, I managed to help hang our annual Dupont Art Show where I was successful with the sale of a couple of my pieces. Tomorrow I am helping to hang an Embroiders Guild show at Nyman’s National Trust site. It will run for a week and show be lovely to see. Recently I spent a lovely day with two girlfriends looking at the magnificent Chagall stained glass windows in the wee little All Saints Church located in the middle of the beautiful Kent countryside. We were the only ones there so we were able to sit and sketch some of these windows, absorbing the peace and reverence of this chapel. Marc Chagall was commissioned to do these about 60 years ago by a wealthy member of the church in memory of this families’ daughter who drown at the age 21. The colours are amazing with the blues and gold which painted the inside of the chapel. I loved his sensitive reference to the daughter in many of the windows. This is surly a must to see for anyone coming to Kent in England.To complete the day, there was an old 14th century pub close by where we had a yummy lunch in their out door patio. It is now the calm before the storm with the opening of the Brighton Festival Artist Open Houses which I am in. This is a huge month long event during the year and a busy one for artists. I was asked to help organise a new artists open house here in Patcham last summer. It has been a lot of work and an education on setting one up. I will now be in three open houses including the Embroiders Guild one this year which is just a little crazy but fun. The private views for all three are being held this Friday but thankfully at slightly different times. If any friends are around for this, please come and view either during the private view or on weekends during the month of May. PATCHAM ARTS OPEN HOUSE! INVITES YOU TO ! ! PRIVATE VIEW ! Sheffield Park by Judy Alexander ! on! on Friday, May 9th , 6pm – 8pm! at! Patcham Community Centre! Ladies Mile Road! Patcham, Brighton BN18TA! ! Wow, turners seas are so dramatic and full of action. On the 15th my husband and I visited the show, Turner and the Sea at Greenwich. It had mainly his large oils which gave me goose bumps. The energy that oozed out was amazing. He had many layers of oil put on with his great expertise. I have enjoyed painting a couple of these as studies. It is an excellent way to learn. On April 5th I had the pleasure of presenting my Paper, Paint and Stitch workshop at Leslie Irving’s Studio in Chewton Mendip, Sommerset. What a fun group of textile artists attended. Leslie spoiled us with an amazing lunch. Her studio is in the midst of a fabulous garden which would inspire anyone to do great work. Yesterday I meandered my way through the trains and tubes to the Excel Centre in east London to attend the Creative Stiches and Hobbycraft show. I was there to help fellow textile artist Bobby Britnell in her booth which was to support her charity, ‘Hands up for Ugands’. It was lovely to see Bobby again and we had much to catch up with. The work using natural materials made by the people in her Ugandan village was inspiring as was all the work her charity is doing to improve their lives. It was interesting to see the difference in directions of some of these shows. This one was aimed at people who sew and quilt as well as hobby craft people. It is not as varied as the big shows such as the knitting and stitching show at Alexander Palace and Birmingham which appeals more to textile artists who are into all sorts of methods of using surface design. I snapped a quick picture of Bobby standing in front of the pair of shoes which I decorated. I am just completing a three day oil painting course with a wonderful teacher and artist, Martin Kinnear. It is on abstraction with oil painting. My brain is stuffed full of his teachings. While staying at his old studio which is rented out to students, I took a walk in the morning and met a lovely man walking his dog. I couldn’t help talking a quick photo do them which shows the beauty of this alluring countryside. As an artist, we appreciate the power of great design in our work. It just makes things so much more successful be it a piece of art or equipment. My husband and I just purchased two folding Bromton bikes and I am amazed at how this 25 year old design is so exceptional. It has not changed in all those years as it works and delivers on all fronts. Taking it for it’s first ride yesterday on the windy Brighton waterfront, I passed a group of young men and heard the comment ‘cute’. As I looked up expectantly, I realised that they were looking at my bike! As I said, good design delivers on all fronts! In my previous post, the picture of my painting did not transfer and being less then capable of fixing it, I will just add the picture of the painting here. A fees weeks ago I was travelling home on the Brighton bus when we passed the Royal Pavilion. As I looked I realised what a great painting it would make silloetted against the sky. I immediately got off at the next stop and walked back to the pavilion, climbed over the low garden fence and walked around the rather soggy grounds snapping away with my iPhone. The gardensers must have thought me a little deranged or just some crazy artist. I have been assisting Tina Stiles with the organising of the BHAC art show which will take place April 8-12, 2014. There is much to be done for such a large show. I was pleased that the committee chose my painting of the Royal Pavilion for the private invitations. If my friends are here in Brighton, I would love for them to attend. Earlier this month I spent a splendid day with textile friend Donna Jones viewing the 80’s fashion retrospective show called Club to Catwalk. We also took in the lovely the pearl show. Seeing two in one day kept us on our toes. The fashion show was amazing to see. It continues until February 16th. The use of beautiful textiles alongside rather amazing chains, feather spiky hats and color combinations was a site to see. We gaped at the everyday outfit that a KISS band member wore complete with cod piece. In the write up he said that he couldn’t understand why everyone looked so shocked when he wore it out to the grocery store. The 80’s fashions are popular again at present which shows that there is nothing really new in the art world. We just borrow from the past. A couple of days ago I had the pleasure of celebrating the 72nd birthday of my friend Carol Cleveland. For those who don’t know Carol, she was and is the only female member of the Monty Python group, Carol is listed an actress and comedian. She joined the Pythons over 50 years ago and has continued to pursue her acting and entertaining throughout her life. She has joined the Dupont art group which I am a member of and has sold a number of her paintings as well. Fortunately for her and her Python friends, they have resurrected the Monty Pythons and have sold out 10 performances at London’s huge o2 arena this coming summer. I look at her long career and am reminded that anyone who wants to succeed in their chosen field must put in long hours and persevere. Whether you are a painter, textile artist, actress, musician, writer or are in any other field, one can continue to improve and enjoy the pleasure your profession gives you. Continue to expand your talents in what ever way you choose. Thankyou Carol for sharing your celebrations with me. Spending a day teaching others in new ways to work with textiles can be both educationsl and inspiring. That is what happened this last Saturday when I taught a group of ladies from the Brighton Embroiders Guild. We spent the day investigating various ways of working with dissolvable papers, bona web, lutradure, fibretex, tyvec, etc. This was scheduled to help prepare members of the club to make inspirational textile pieces with unusual textiles and materials in preparation for the month long Brighton Arts Festival next May. We layered, painted, burned and stitched away during the day. The resulting group were excited about new techniques available to them with their work with textiles. Their samples were great. I can’t wait to see what they will produce in the future. 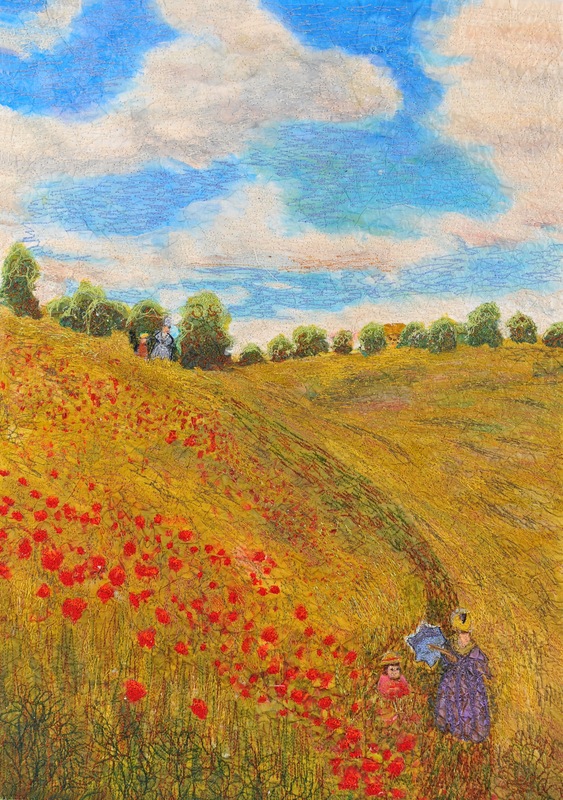 As part of my series, Painting the Masters, I have just completed this picture which was inspired by Millet’s Angelus. This is part of a series under the able direction of Martin Kinnear, oil painter and teacher in Norfolk, UK. This painting was completed in 1859 on commission but never collected. It was then named Prayer for the Potato Crop. Millet therefore renamed it. Angelus, and it was shown in 1865. It is through practice that we can improve our skills, in what ever venue they may be. With this piece, the use of multiple glazes was necessary to achieve the sombreness of the subject. Overlaying colour in glazes or even with sheers on textile pieces can add complexity and depth to the work. I hope that you enjoy this. When it doesn’t rain, it pours! I have been fortunate enough to be involved in not one but two textile shows in BC which will show concurrently. I helped to hang both shows. The first one was at the Kay Meek Centre where my piece Reeds on Red is hung in West Vancouver and runs until October 27th. The second is at the White Rock library and is the annual Outside the Box show. I helped to hang it today. My pieces called Galaxy and Flower Garden ( which is made of painted burned tyvec) are in this show. Both have a wonderful variety of excellent textile pieces. Tomorrow is the opening night for the out of the box show. It has been well advertised which is positive for a textile show. These shows are often over looked in favour of traditional art. Yeah. August has rolled around again with the art group I belong to having their annual show. For those of you who wander into a gallery or an art show, little do you possibly appreciate the time and work it takes to prepare for a show, this one was three days long complete with the service of tea and cakes. I helped to hang it and was exhausted after a full day of setting up screens, and hanging well over a hundred paintings. It was so worth it as this show was our most successful with many paintings and cards being sold. I was pleased to sell my Poplars on the Epte oil painting on the first day. I had plans to hang it in our dining room but alas, someone else will have that pleasure. On the final day, our Lord Mayor of Brighton appeared in full mayoral dress at our invitation.Apparently she had flip flops on underneath the large cape. She was very charming and had definate likes and dislikes with the paintings. I was asked to explain some of the paintings to her, thus the picture below. Shows like this are definitely a positive way to set goals for our club and bring folks together in art. From July 22nd to July 26th I had the pleasure in attending the Textile Study Group’s summer school which was held at Harper Adams University in Schropshire, UK. The theme of the summer school was ‘Breaking Boundaries’. There were three members teaching that week. I had signed up with Anne Wheeler who was looking at structures. As I enjoy my spirals, I thought that this would broaden my subjects and was not disappointed. Anne is a lovely knowledgable fun teacher who has a wealth of experience with structures such as lace making as well as other things. Now you may think of lace as involving fine thread and tiny stitches but not with Ann. We were treated to lace made with wire, heavy strings and threads and whatever one wanted to use. We also used objects such as seed pods which we thoroughly investigated cutting into them and drawing and remaking them with various materials. I chose to work with a piece of Kozo which is from the mulberry tree. It looks like shrunken up hard bark but when soaked in water, will stretch out magnificently. This can be stitched, dyed, and used for many things. I elected to heavily machine stitch these pieces with various weights of threads and yarns. I am going to continue to stitch into the large wall hanging with various fine threads but will show you the results of my endeavours now. I also made a small piece which I called Round and Round the Mulberry. The last one is a picture of art made by my friend and fellow student, Donna Jones, who was in the class taught by Sian Martin. On July 13 gave a workshop sponsored by the Brighton embroiders guild here in Patcham. It was so much fun teaching a group of enthusiastic and talented stitchers how to paint on watercolor paper, bond it to calico and stitch it. They were soon having great fun in adding sheers and threads for embellishment. It was a seven hour workshop which resulted in some really lovely work. As always, one learns by teaching and I thoroughly enjoyed this class. The guild has booked me to do another workshop next year on wild and wonderful new techniques in stitching and art. It should be an adventure! On Saturday the 15th Brighton and Hove celebrated People’s day with dozens of organisations and groups performing or displaying their organisations, works and talents. Thousands attended with kids playing in the makeshift playgrounds, food courts busily selling all sorts of food and singers and dancers strutting their stuff. We at DuPont art had about six of us painting and displaying some of our art in order to advertise DuPont. I brought my iPad as the kids love watching me draw on it and adults are fascinated that one can do this on an iPad. The mayor and her assistant came along and wanted to be shown how it worked as well. This picture captured the moment. The art behind me shows a couple of pictures and textile pieces that I brought to display as well. The other picture below is of a Monet that I did on the iPad. I find that it is a good tool for design and handy to take where water, paint and stitch are not easily used. On may 28th I visited the Queen’s Gallery, Buckingham Palace to see the wonderful show called ‘the Art of Tutor and Stuart Fashion. It is a stunning exhibition of paintings of glorious clothing and textiles as well as actual pieces of clothing and textiles. It is on until October 6, 2013. On the same day, I took in the textile show by Prism at the Mall Galleries which was innovative and a must to see. On May 23rd I drove with a friend to the Horsham Quilters Guild day to listen to a talk by Jan Beany, one of the two artists known as Double Trouble. These two artists have over 20 books to their credit and travel the world to teach various textile techniques. i have had the pleasure of taking a couple of courses from her business partner, Jean Littlejohn and enjoyed them thoroughly . This was the reason I wanted to hear from Jan.
She showed her work over the years and talked of the way she does her art. She emphasised using her journal and really looking at things before dealving in. These wise words can apply to any typed of art. Her journals were lovely and colourful as can be seen here. On May 18th I helped with a workshop at Ascention arts which is part of the Brighton and Hove Fringe Festival. It involved working with 6-14 year old children from the young embroiders group as well as local children. I was able to show them how to construct screen backed textile spirals which could be hung in their gardens. It was great fun. The imaginations and innate skills they showed with this was a pleasure to see. Most importantly, they had fun in working with mixed media including textiles at such a young age. A delightful yearly gathering of my three sisters included a theatre weekend in London and tours of the cities treasures. After a delightful lunch with our husbands and the Van der Welle’s, it culminated with the four of us fitting rather tightly into a London red phone box! After a very busy time in BC which ended with a super trip to the Sechelt meeting of the surface design group, we are back in Brighton. Having survived a week of jet lag, we went to the opening of the Brighton and Hove Arts Council show last night where I have several pieces. One of my encaustic pieces is shown in this picture. I was delighted to have a sale of one of my small pieces which was called black cat. Our local art store chain has a series of free demos using many types of art processes. To my delight, I saw that Catherine was listed as one of the presenters on march 23rd and immediately signed up. Catherine is a well known textile artist and teacher and one not to be missed. She is also a very charming person who is generous with her knowledge. She demonstrated mark making on fabric. 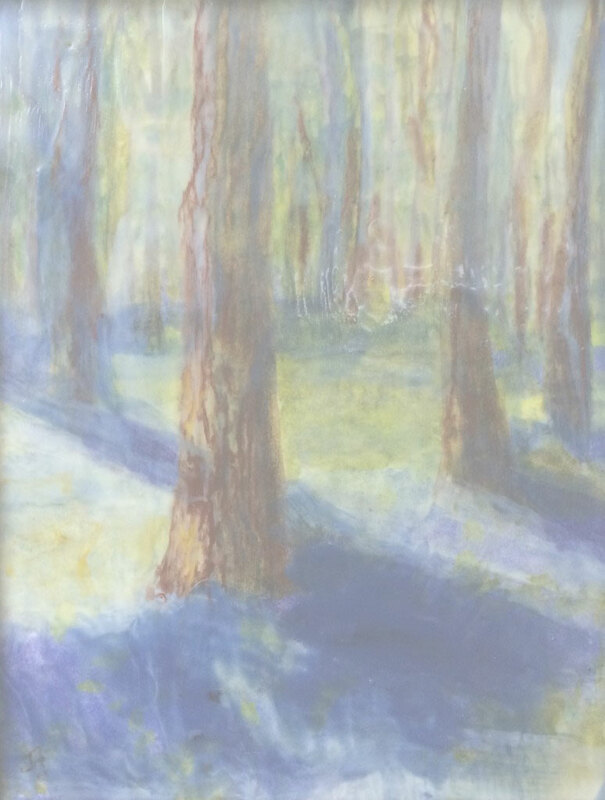 As she studied art and painting before studying her textiles with city and guilds, she is comfortable with the use of acrylic paints and inks on fabric which produce lovely effects. She is also part of the three fold group with Lara and Linda Kemshall. On march 18th I drove down to the lovely La Conner area of Washington, just south of our White Rock home in order to pick up my piece of art which was shown at the recent successful show of students of Gail Harker Everette Washington. The drive to the La Conner area is so beautiful with the fields of daffodils waving in the breeze. Gail Harker’s school is located in a wonderful converted huge old barn loaded with bright areas for her many students to work in. I have included a couple of pictures of it as well as my piece of art called ‘galaxy’ which I picked up. We are here at our Canadian home in White Rock. Although it has been a wet spring here, there have been sunny days as week. This morning walk along the ocean front was a delight. I so enjoyed the sun and shadows on the water as well as the glisten of it on the large white rock which sits on the beach. The wind surfer took my breath away with the flips and speed which occurred. It makes me itch for my paints. I attended a wonderful presentation of Valentino, Master of Couture at the Somerset House, London on February 12th. What a wonderful display of his beautiful gowns which were designed over the past 40+ years. So many famous people wore his designs and I can see why. The gowns were amazingly beautiful with lace, jewels, and also clean classical lines. What a treat. The Cutting Edge Art Group is having a show at the Squamish library foyer gallery in British Columbia from February 5th to march 4th. It is called Read on Red. I have a piece in it which is also featured on the invitation called Reeds on Red. With all that hand sewing, it took a couple of months to complete it. On this sunny day, I played with art on my iPad with friends. I have used the ‘Brushes’ app in the past and still enjoy using it. I discovered a new app for me called Artstudio. I found it to be a more advanced app which was also easy to use. It could be a useful tool to use for designing and even creating iPad art. I like being able to include text with it. This little leaf was a quick study. Gee, in about 12 hours we had about 6 inches of snow come down. As usual, roads were a mess, airports closed, schools closed, etc. and more is forecast in the next few days. This is an adventure. I have been painting it. On January13th we attended a birthday party being held in the beautiful grounds of Brighton’s Royal Pavilion. Each year they have an ice rink and surrounding marquees with a restaurant. I loved the way they bathed the Pavillion in lights which changed as you watched. They gave this beautiful old building a new look. I may just try this adding new colour to some of my art! Today is the start of the art show, ‘Complex Threads’ being held at the Schack Art Center in Everette Washington. It involves former students of the Gail Harker Center for Creative Arts. I have a piece called ‘Galaxy’. In the show and hope that friends in Canada and the USA will be able to visit it as the other artists involved are amazing. My husband Chris and I celebrated the coming of the new year with friends. Looking back over 2012, I feel very blessed and thankful to have had the opportunities to share my art with others, to travel to various places in the world and to be surrounded by loving family and friends. This morning I awoke early and lay in bed listening to the morning singing of the birds. Their music was so cheerful and melodic. It makes one love nature and appreciate what we have in life. Here in England, we are once again having dreadful floods in sections of this country. In America they continue to bury their children. Amidst this life goes on. As Echart Tolle says in his ‘Power of Now’ , we should learn from the past and live life in the present. This picture was taken on a morning walk on Brighton’s sea front after a storm. We had the results and party for the ‘painting the pub competition’ with my DuPont art club. It took place at the Duke of Wellington where we have a permanent gallery for our art. The patrons of the pub voted over the past two months on their favourite painting. I was fortunate enough to have my two entries sell and one of them came in third. I was so chuffed that I had to have an extra glass of wine at the party in celebration. Brighton photographer, Nick Ford, and I work together on occasion. He forwarded this lovely close up photo of a sculpture which is on the Brighton sea front. In order to understand the full sculpture, I have included a photo I took of it in it’s entirety. It is affectionately known as ‘the donut’. I have shown the transition which I have taken it from his photo to textile stitching of the photo to an encaustic painting interpretation. I enjoyed this process of using different media. Well, we had a lovely flight home only to discover a rather wet carpet under the Eve’s. Apparently the hot water cylinder had cracked and started to leak after my father in law turned on the heat the week before. Luckily the rug soaked up most of it and it did not go through the ceiling. The nice part was that British gas responded immediately and it was replaced in one day. In addition, they sent the nicest handsome man to do the work!! Last night I attended a retirement party with people from my former employer, the WCB, for my former coworkers, Eric Fielder and his wife Debra. It was lovely seeing many faces from the past. It was also amazing to hear how we used to work and how technology has changed everything. It was a most enjoyable evening. The good we do does follow us. From September 29-31st I attended a two day workshop given by Jason Pollan on mixed media. The aim was to extend ones comfort zone in art. We’ll, the few studies created certainly did that as these two pieces can attest to. They are not my usual style. It is nice to be able to sit back and play with new ideas and have the chance to meet new artists. Saltspring island was a great place to do this. My stay with Bud and Brenda Bowes and their new puppy Sopie was an extra treat. My piece which I have titled, ‘Reeds on Red’, is finally finished after dozens of hours of work. It is hand stitched mainly on painted silk. The size is 30 x 48 inches so required many hours of stitching. It will go into two shows in 2013 here in Canada with the Cutting Edge Artists. There is nothing more rewarding and fun then spending a day out with a soul mate who is also a wonderful artist. That is exactly what happened yesterday when my dear friend, Anni Hunt Martin and I spent the afternoon wandering around the magnificent acres of Vancouver’s Van Dussen Gardens. They have had a wonderful display called ‘Earth Art, scattered throughout the park. It is nearing the end of this show so some of the pieces had naturally faded, just like our gardens do in the fall. Artist, Nicole Dextras produced multiple manikins made from natural fibres which apparently were green when first set up but have faded in a most beautiful was as fall has set in. The show is set to come down in a week or so. Here are some of the Earth Art pieces. A day with fellow artist Joanne Waters in West Vancouver showed those of us there, the diversity of art. Joanne makes beautiful wire sculptures which she sells. I must say that you need to get your hands and wrists in shape to do this on a regular basis. This little pot which I produced took about five hours to make. Attending a lunch with former colleagues can be fun. When it involves displaying art, it becomes even more interesting. This is what happened with the work safe retirees semi annual lunch. It was great fun to be asked to show what I had been up to with my art. Such positive feedback sure can fire up one’s enthusiasm to go out and produce more. What a lovely three days in an encaustic workshop with Patricia Baldwin Seggebruch. It was held in a roaring rain storm on West Vancouver’s waterfront. Encaustic (wax painting) can be used with various types of mixed media. The glow of the wax adds a lovely dimension to art. We are leaving Osoyous BC after a holiday which included Calgary and my family, Yellowstone National Park and it’s beauty and animals, Lethbridge Alberta, my old alma mater and a visit to it’s hospital this time and finally a lovely stay in the Okanagan Valley where we toured many wine vineyards. This was a lovely (other then the hospital) sunny break. Now we wind our way back through the mountains enjoying their fall color to return to our home in White Rock where I will delve back into my art, fully charged. We are driving down to Yellowstone national park and this sign in Montana certainly caught our eye. We tip toed carefully to the washrooms -no rattles heard. On September 18th, I spent a glorious sunny day dying shibori with my friend, Anni Hunt at her home. We mucked into the synthetic and original indigo dyes turning ourselves and many pieces of cloth a lovely blue colour. I over dyed an old piece of garment which my late mother owned and will make it into a wall hanging for my niece Claire. It will be a nice memory for her. My sister Faye has joined Patty and I here in White Rock for a lovely walk along the sea front. It is lovely to have sisters. Chris and I are busy getting ready for our travel back to our home in Canada. Although I don’t need to take any clothing as I have plenty at our other home, gosh, do I have lots of art supplies and pieces to pack. I have a show which starts today in White Rock and will be putting on a small display of my work at Work Safe BC when I go to the retirees lunch. I also just completed a small 5×7 stitched and painted piece for Gail Harkers’ Black,White and Red charity show which I will mail to her when we arrive back in White Rock. I have taken a picture of it. It was inspired by a lovely picture that Chris took of the Jack and Jill windmills close to home here in Brighton. What a warm sunny day was spent walking through the lovely wetlands of Arundal. We took a boat trip and saw a rare water vole munching on a reed. I went with my three coven friends, Anne, Maggie and Hazel. 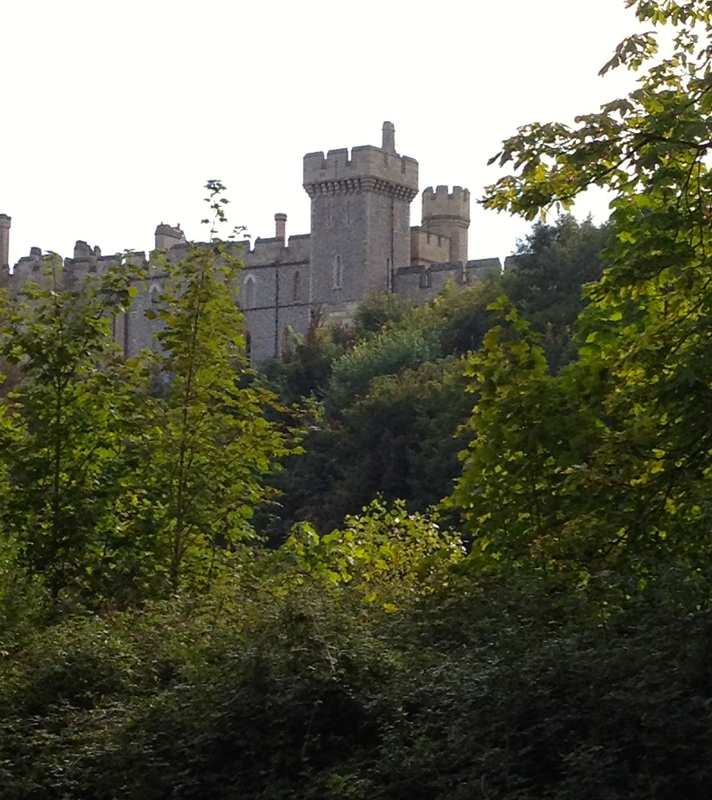 The beautiful castle of Arundal towered over us during our visit. How inspirational the day was. Bike racing in the new velodrome. August 29th and we were away to see the bike racing in the new veledrome. The olympic park was huge and so well done. 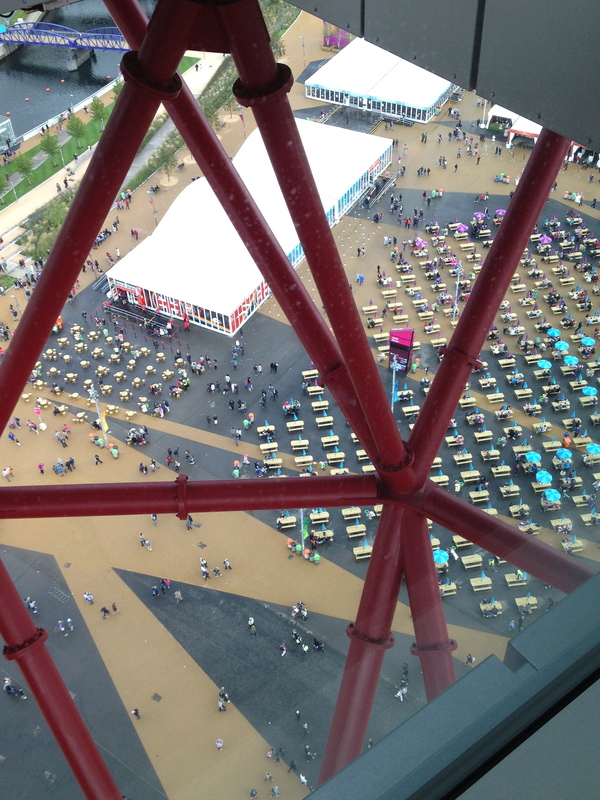 We were able to get tickets that morning for the 20+ storey Orbit and were amazed with it. You can see forever from way up there. It is not a place for people who hate heights! I had to take a bravery pill. Ahh, August 29th was a lovely sunny breezy day out with my Dupont Art friends painting on Brighton beach front. I found the donut statue that Nick had photographed and it is huge! I painted it, ate ice cream and had a lovely fresh crab sandwich. What a lovely day out. Today Nick Ford, Brighton Photographer, dropped by my studio to discuss a possible collaboration using his lovely photos and my textile art. His photos can be seen a www.nafphotos.co.uk. On August 22nd fellow artist, Jane Jukes and I attended Brighton City Hall to present the Mayor with paintings which were for the Brighton and Hove fund raiser. Mr. Mayor had invited us to come for tea in appreciation for the pieces of art which we had donated. As I had admired the magnificent old building he took us up to see the ancient council chambers. I wish that I had taken a pictures of the old leather carved chairs, each with it’s own small desk in front complete with a brass covered ink well! It was a delightful visit. I hope that my ‘Cave Pony” painting, shown here, brings in a few pounds towards their fund raising goal. On August 11th we attended the modern pentathlon games here in London’s Olympics. They were held at the Greenwich area and included the equestrian jumping. It was so exciting with the crowds roaring their encouragement to all riders. The feeling of joy and camaraderie was everywhere. We sailed up the Themes river from London to get to the venue passing a huge aircraft carrier which was standing guard on the city and Olympics. Everything went off well with the closing ceremonies ending a very successful Olympics for the UK. Canada did not do as well but did not expect to as winter Olympics where we shine. the pictures include the view from Greenwich which overlooks Canary warf and the Canada Tower(the tall pointed building), the aircraft carrier with a marine on duty and finally Tower Bridge with those wonderful Olympic circles. Next will be the para Olympics! From July 23rd to 28th, I attended the summer school for the Textile Study group at Harper Adams College in Schropshire. The tutor I chose was Ruth Issett who’s week long workshop was on colour. It was educational even for those of us who have studied this subject previously. I have never laughed so much with other students I had just met. It was loads of fun. One of the exercises was to choose an artist whose colors you liked. I chose Ton Schulten, a dutch artist who paints in fantastic colors. This picture shows the picture of his work with the section I chose to use, my collage of this section, and finally, my stitched interpretation of the collage. On July 19th I went with friends to view the ’50’s Ball Gowns at the Victoria and Albert museum in London. It was absolutely fabulous. The designs at that time were so beautiful. I noticed that all the gowns were made of various types of silks which made them shimmer. On July 16th the Olympic flame arrived in Brighton. We had tickets for the celebration in the Cricket ground which I am sure is still recovering from over 10,000 people trampling all over it. Yesterday, July 14th Dupont Art took part in Brighton Friends Day. It felt like half the city had converged into the down town area. I assisted with a couple of members in setting up a small showing of our art and demonstrated producing art on my iPad. This picture is taken in the morning as we were just getting organised. Beyond Quilting with the Romsey Quilters. I attended our Embroiders Guild Regional conference yesterday and heard Alice Kettle give an excellent presentation on her past, present and future work. She sews huge pieces and has commissions around the world. She paints with thread and is now doing many unusual faces and figures in her work. It was wonderful to hear that she stitches into paper which excited me as I love this as well. She uses a Bernina digital machine and continues to investigate the digital properties and use this in her work. I spoke to her after her presentation, bought her machine embroidery book and took a picture of her latest very large work. I have shown it here along with a picture of the two of us. What a treat of a day! We went to The New London Theatre to see the play ‘War Horse”. It was fantastic. The design and execution of the puppet horses was incredible. On June 17th we visited the awesome new studio of Claire Benn and Leslie Morgan in Surrey, UK. during their open art studio week.